Morocco’s bustling souks swirl with the smell of spices formed into pointed peaks and a kaleidoscope of dried fruits and flowers arranged into baskets and barrels. This, in essence, is Morocco—effusively beautiful, meticulous in appearance, and beguiling to the senses. Cool hikes through a misty forest are as easily had as a camel ride on the ethereal dunes at the foothills of the Atlas Mountains. 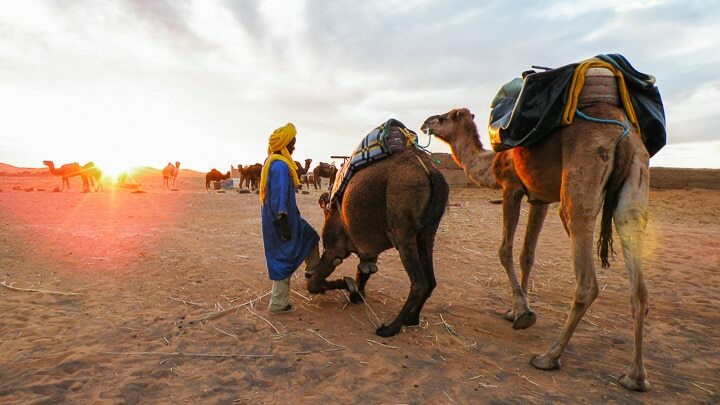 Follow roads traveled only by donkeys and shepherds tending their flocks into ancient cities and Berber villages. Begin mornings with Moroccan mint tea famously poured from a silver pot held high, and end each day beneath the desert stars, trusting your bicycle to lift the veil on the vitality of north Africa. Arabic coffee, Moroccan mint tea, and unique local reds and rosés like Clairet de Meknès, Boulaouane, and Guerrouane.